KOMTAR is the acronym for Kompleks Tun Abdul Razak, named after the country's second prime minister, the late Tun Abdul Razak bin Hussein Al-Haj. 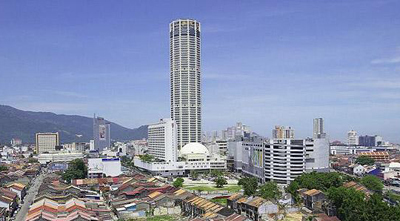 It is not to be confused with the Johor Bahru KOMTAR which has only 25 storeys, because the KOMTAR in Penang has 65 storeys. There is also a special structure, which is the Dewan Tunku Geodesic Dome, a design which was once the pride of Malaysia because it is one of the first geodesic domes in the country. The geodestic dome was designed and created for the purpose of making it into a venue for performances, official functions, concerts and other events such as exhibitions. The concept of geodestic structure was first created by Walther Bauersfeld for the Carl Zeiss optical company in year 1922. The dome is situated at level 4 of KOMTAR, and the main entrance is from the auditorium level. KOMTAR, with its 65 storeys, occupies an 11 hectare site. The building works begain since 1 January 1974, with the piling works done by the late Tun Abdul Razak. After the building works had gone on for 9 years, a fire suddenly broke out in 1983 at the 43rd floor of the building, devouring the floors above it. Many Penangites still remembers that incident, as they look at the building from below, and some wishing that the wind will change to rain to kill off the fire. Firemen were not able to put out the flames, and the flames burnt for eight hours. Five years later in 1988, KOMTAR was completed. It became a hit to the locals, and most government departments moved in there to occupy the building. Even before it was completed, the Shangri-La Hotel was opened in 1986, and today it is the Traders Hotel. As an effort to boost more visitors, Prangin Mall was also built connected to KOMTAR, and was officially opened in year 2000. When the new Penang State Government took over the state's administration, plans for the restoration works began, first by relocating the state government's administrative offices to Bayan Mutiara in 2008, and the sign up of a new tenant, Pacific, to replace Super Komtar Supermarket and Departmental Store. One year later, Komtar Walk was opened outside Pacific's main entrance. The Komtar Walk stretches a distance of 155 meters and comes with a performance stage, water features and soft landscapes, supported by 19 high-end food and beverages outlets are set to be an active attraction that wakes up KOMTAR once more with its slogan, “One-Stop Dining Place”. While a lot of people know that KOMTAR is full of retails, very few people know that there is a duty free shop on the 57th floor. There is also the Tower Tourist Centre on Level 60, and visitors can get a scenic view of the island, and even as far as some parts of mainland Butterworth and the Penang Bridge. At this moment, however, both the duty free shop and the observation deck is closed for the restoration works of the building. A new addition to KOMTAR during this restoration is the ICT Digital Mall, which is a new retail development that occupies the space originally taken up by Yaohan Department Store succeeded by Aktif Lifestyle Store. It is a heaven for IT lovers, offering a lot of electrical and electronic products. There are computer hardware and software, mobile phones and even cameras and photography items. What makes KOMTAR a spot with a lot of human movement is the KOMTAR Bus Terminal, which is actually a bus station right at its foot. Although it is not a terminal (being that the terminal is actually the Weld Quay Bus Terminal with routes ending there), many buses do stop at KOMTAR in their route around the island. Rapid bus, a bus service with improved routes and newer buses, offer their routes around the island and stopping by at KOMTAR as well. However, since it is not a real terminal but is a bus station, the buses do not wait for more than five minutes at KOMTAR. The latest addition to KOMTAR is 1st Avenue Shopping Mall, covering 655,000 square feet and reaches 7 levels of retail shops that has become one of the more popular outlets in Penang. While the restoration works are still going on, Penangites may anticipate that there will be more improvements to KOMTAR. It is a place that Penangites had loved and had seen it gone to waste, but which is now getting a second chance to life. This entry was posted in Tourism & Leisure and tagged 1st Avenue, George Town, Georgetown, georgetown Penang, Kompleks Tun Abdul Razak, KOMTAR, KOMTAR bus terminal, Penang, Penang's tallest building by admin. Bookmark the permalink. Excellent website. Lots of useful information here. I’m sending it to several friends ans also sharing in delicious. And of course, thank you on your effort!